Most of the world depends upon extremely accurate Global Navigation Satellite Systems (GNSS), such as GPS for precise navigation and timing services. Forms of interference to these satellite-based systems, such as jamming and spoofing are growing in frequency and severity. 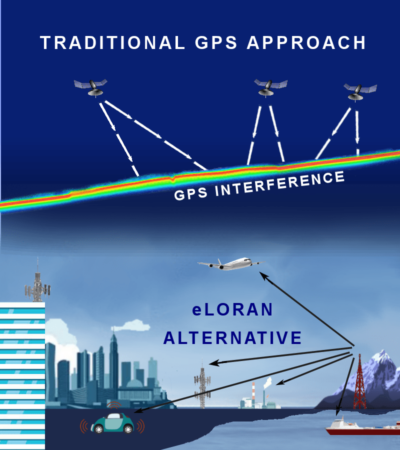 eLoran is a high power terrestrial based navigation and timing system, which can provide a backup to satellite based systems. eLoran is inherently more robust to interference or manipulation. For over 50 years, CEC has been producing LF transmitters, which power eLoran technology. Hundreds of transmitters deployed around the world; no other manufacturer has delivered more LF/VLF transmitters. Patented CEC Technology allows for shorter eLoran antennas, eliminating previous concerns over size of antennae footprint. 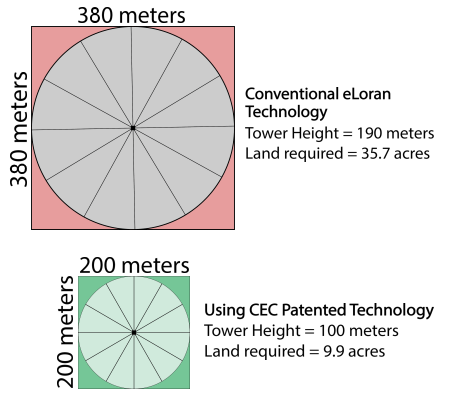 Serving as a resilient PNT systems patented CEC eLoran technology reduces required height of an antenna by up to 50%, decreasing land footprint by approximately 75%. Patented CEC technology allows for shorter eLoran antennas. Reducing the height of an antenna by up to a half decreases the required land by approximately 75%. Frequency – 100kHz, other frequencies upon request. Active Pulse-Tail Recovery for interference reduction and added efficiency. Variomoters designed and manufactured by CEC. Protective spark gap protects from lightning induced transients. CEC’s Gas-Cap® Capacitors typically used in matching networks along with variometers to match transmitter output impedance. eLoran is a high power, Low Frequency (LF), ground wave radio broadcast system, capable of providing 10-20 meter positioning accuracy, Stratum-1 frequency distribution, and Universal Time Coordinated (UTC) timing well within one microsecond (μs) across very large areas (1,000 miles).